Around Thanksgiving, from Wednesday, Nov. 21, to Sunday, Nov. 25, the American Automobile Association (AAA) is projecting that 54.3 million will travel 50 miles or more away from home. The estimate is up 2.5 million from last year and will be the greatest in more than a dozen years, AAA stated in a press release. The sheer volume of vehicles on the road in congested metro areas may cause travel time to double, triple or quadruple. 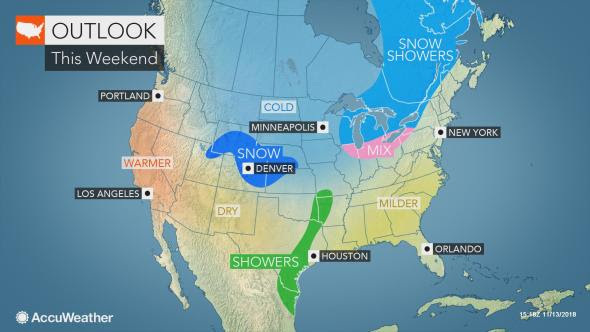 The storm scheduled to bring a broad area of rain, ice and snow to the central and eastern part of the nation from late Wednesday to Friday should be the caboose in the recent train of large storms and widespread travel disruptions. However, there will be small-scale weather concerns moving forward leading up to Thanksgiving Day.